At this point, it seems pretty clear that Donald Trump has a creepy, Single White Female-esque obsession with Barack Obama, as underlined by the time he had a bakery recreate the exact cake from one of Obama’s inaugurations for his own inauguration. And because of that he’s always struggling to prove that he’s just as good as his presidential predecessor, even though he’s not and he never will be. 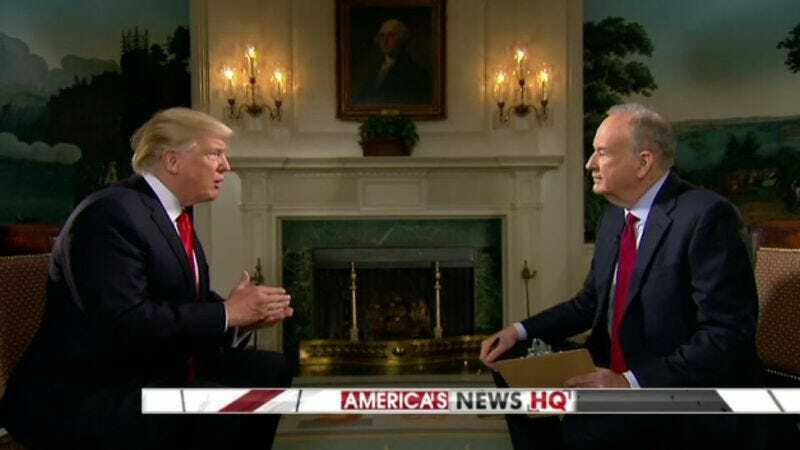 Just last night, Trump took another page from Obama’s book by doing a pre-Super Bowl interview with Bill O’Reilly, a tradition that Obama also took part in during his years in office. Unfortunately, Trump’s still going to end up screaming into his pillow tonight until he can wipe away the tears long enough for a Twitter rant, because Variety is reporting that the ratings for Obama’s pre-Super Bowl interviews were all better than the ratings for Trump’s interview. The actual numbers haven’t been released yet, but Nielsen’s ratings system gave Trump’s interview a 7.8, which is a relatively meaningless number until you take into account that Obama’s last three pre-Super Bowl interviews received ratings of 9.2, 10.2, and 11.5. For a more direct comparison, Obama’s first pre-Super Bowl interview in 2009 got a 9.6, which translated to 21.9 million viewers. At least we know Trump’s friends in the Kremlin were watching, though they weren’t too happy about it. Now, ratings for something like this don’t really matter, since it’s not like they’re going to stop putting Trump on TV (we’re not that lucky), but everyone in the country has to know that this is just going to eat him up inside. Plus, this is coming in the wake of Trump’s little feud with Arnold Schwarzenegger over The Apprentice’s low ratings, so it’s just a matter of time before he starts putting the blame on anything other than his own unpopularity, such as Nielsen’s biased, so-called ratings system.